Lecce is the heel of Italy and Europe, the bridge on the Mediterranean where different cultures meet and influence each other, building together new horizons. 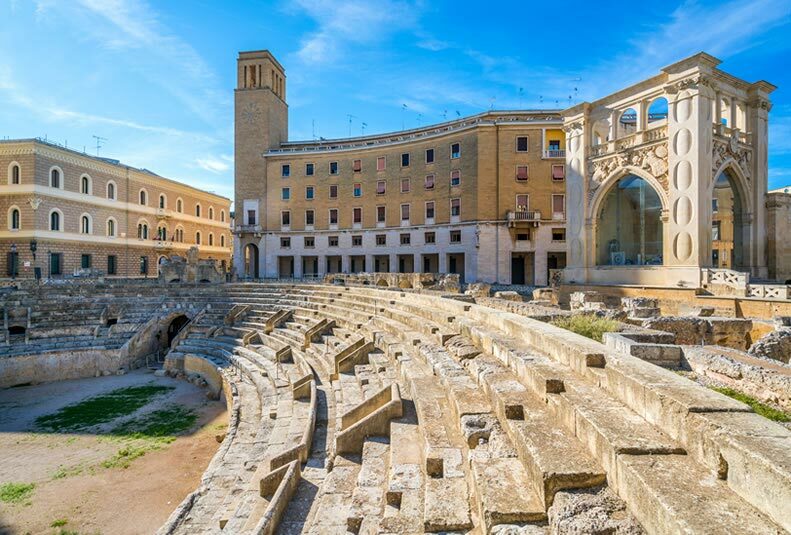 A candidate for the title of European Capital of Culture for 2019, Lecce demonstrates year after year to be much more than a simple summer beach destination. 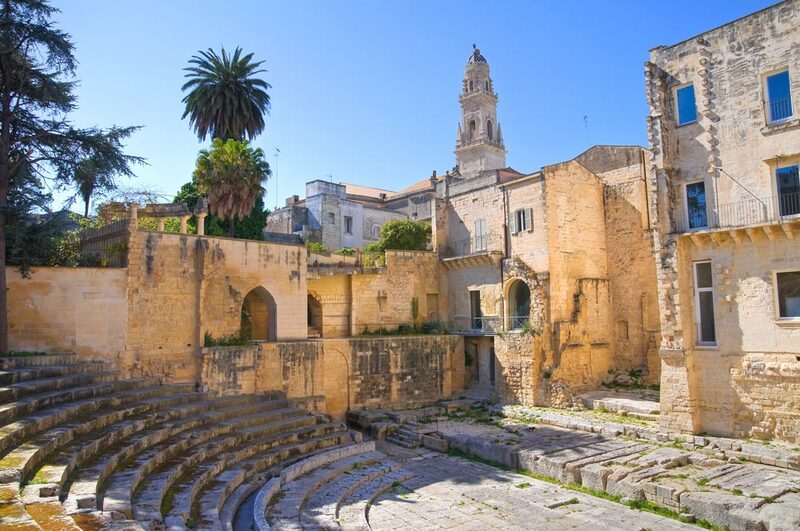 Lecce is history, culture and influences that have followed in time: from Roman times up to the Renaissance, passing through the Middle Ages. 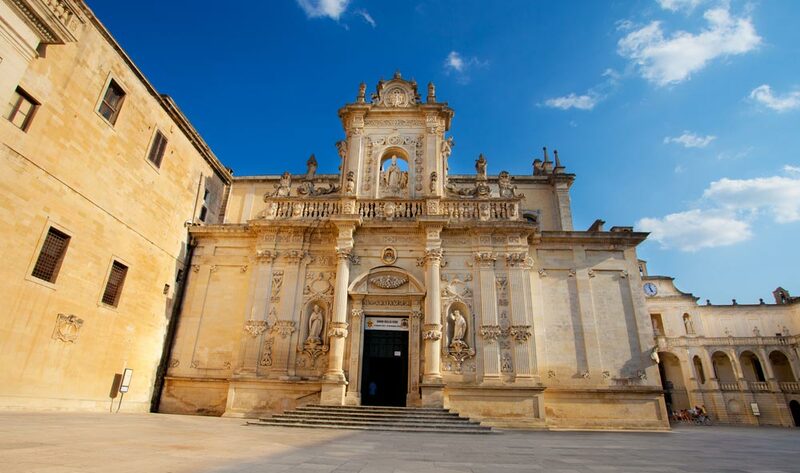 Even if Lecce, for those who loves it, is first of all the lady of the Baroque. The warm and gilded colours of its stone and the flamboyant decorations characterize monuments, churches, balconies and private terraces of the historic centre of the city. 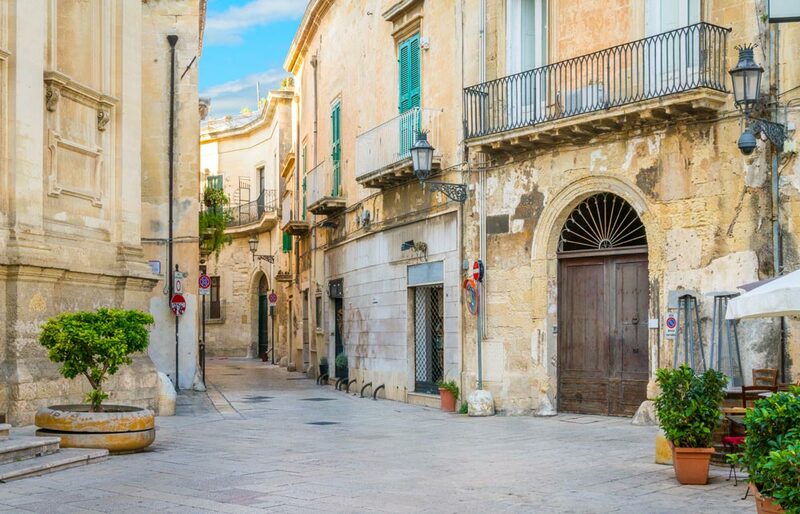 The old town can be reached by crossing Porta Napoli, built in 1548 in honour of Carlo V. From here unwind important streets, dotted with craft shops, refined palaces and ancient churches. You shall visit the church of Santa Maria della Provvidenza and the one of Santa Maria di Costantinopoli, without forgetting Palazzo Adorno and the Basilica of Santa Croce, the symbol of the city. The most important testimony of the Roman town was built in the II century A.D. with the purpose to entertain the spectators with games and shows. Brought back to light at the beginning of the last century, today you can admire only a third of the original monument, hidden under the central Piazza Sant'Oronzo. Near Piazza Sant'Oronzo also rises the city castle, commissioned by King Charles V in 1539. Built on a pre-existing fortification, the castle is formed by two concentric structures, separated from each other by a courtyard and four angular bastions, containing walls and a moat. 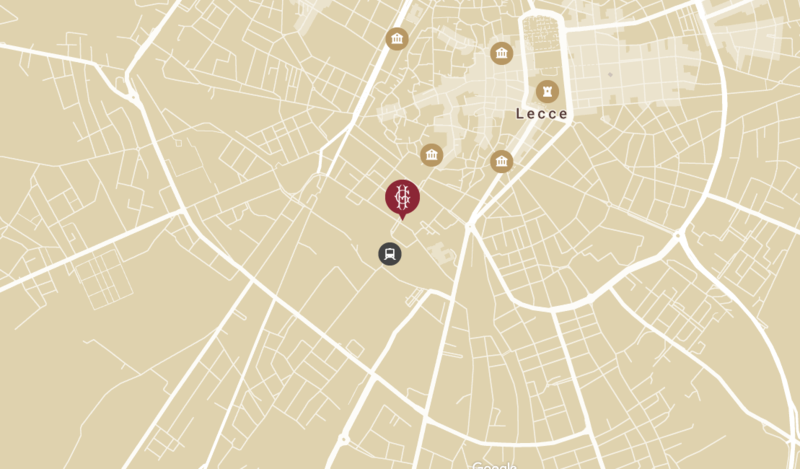 The most important square of Lecce, its social meeting point, is dotted with boutiques and elegant coffee shops. The paving, adorned with mosaic, portrays the Wolf under a holm oak tree and the crown with 5 towers: the city emblem. The buildings are the result of different styles, but together they harmoniously cohabit. 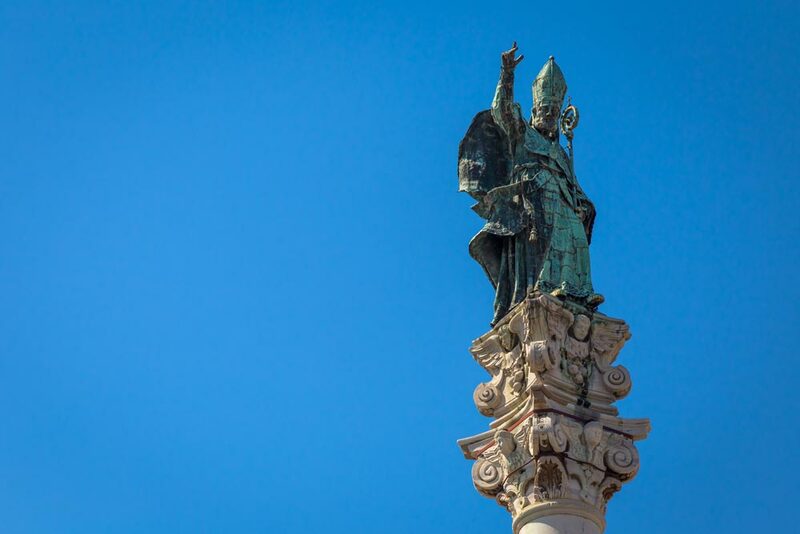 The square is named after the Patron Saint of the city and a votive column on which stands a statue representing him, was erected in his honour. 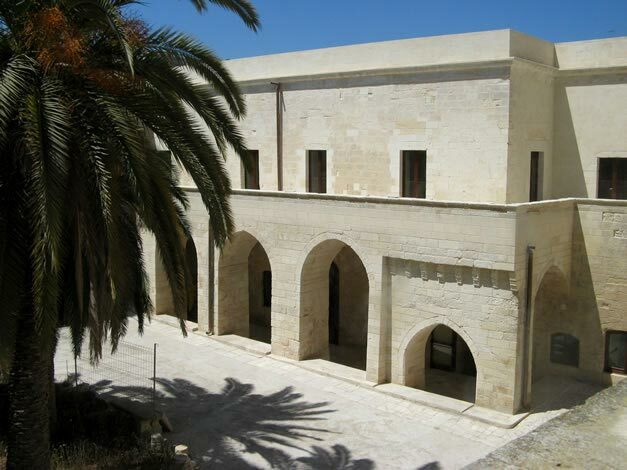 The Cathedral is the fulcrum of the religious life of Lecce and stands on the homonymous square. Built in 1144, it was then rebuilt in the middle of 1600, for the will of the Bishop Luigi Pappacoda. The Cathedral has two entrances and on its main façade are carved the statues of the saints Gennaro and Ludovico, beyond that of the Apostles Peter and Paul. Inside the Cathedral is divided into 3 naves, with baroque interiors, marble floors and 12 altars. 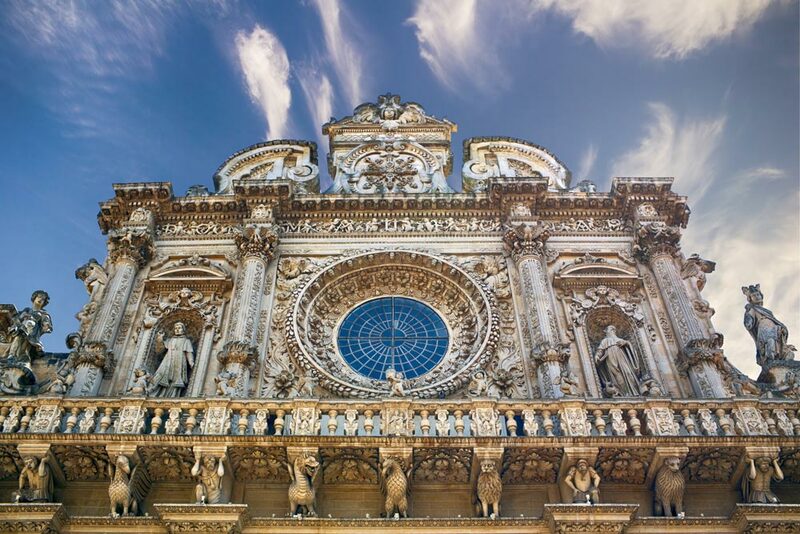 This Basilica is certainly the most significant example of Baroque in Lecce. An opulent and surprising main façade: here a harmonic fusion and wonderful aspects of renaissance and baroque sophistication give life to a monument of spectacular beauty. Among the many elements worthy of note there is the beautiful central rose window flanked by 2 niches with the statues of Saints Benedict and Celestino.